If I uncheck that box, and push the Close button, and open the "Layout Options..." dialog again, the box is still checked. How can I make unchecking that box persist, and the Ctrl+Alt+Backspace shortcut disabled? I know about the xorg.conf options but I don't always have root access, and would like this user-level setting to work. I'm using CentOS 6.5, GNOME 2.28.2, and X.Org 1.13.0. If it works, execute this command every time you log into your machine. There are dozens of ways to automate this, e.g. by adding it to a new shell script that you add to "startup programs" in your window manager's settings - this varies with your window manager. Not the answer you're looking for? 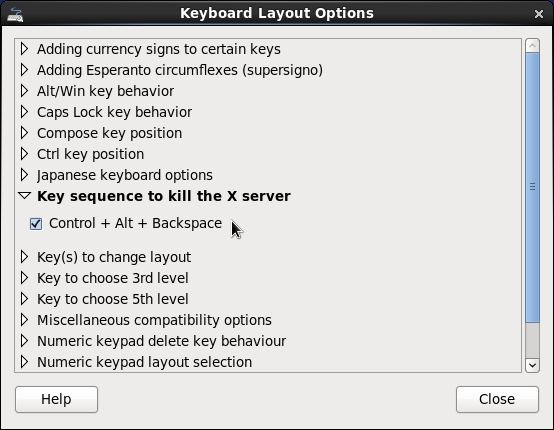 Browse other questions tagged xorg gnome keyboard-shortcuts kill or ask your own question.